The Office of Planning, Research and Evaluation (OPRE) in the Administration for Children and Families (ACF), U.S. Department of Health and Human Services, would like to request that you post the following grant announcement message to any of your relevant websites and/or listservs (e.g., departmental, area/program, graduate listservs) and/or send individually to potential applicants. Please do not modify the text of the following message, since it is official communication from ACF. To assist us in tracking the progress of these postings, please notify us at HSGraduateResearchReviews@icfi.com once the message has been posted. The Office of Planning, Research and Evaluation (OPRE) in the Administration for Children and Families, U.S. Department of Health and Human Services, has recently published two discretionary research funding announcements titled “Early Care and Education Research Scholars: Head Start Graduate Student Research Grants” and “Early Care and Education Research Scholars: Child Care Research Scholars”, which are summarized below. If you have questions regarding these grant announcements, please email HSGraduateResearchReviews@icfi.com or ChildcareScholars@icfi.com, respectively, or call 1-877-350-5913. Potential applicants should sign up for updates on grants.gov to receive notifications and updates regarding these Funding Opportunity Announcements. The purpose of the Early Care and Education Scholars grants are to support doctoral dissertation research addressing issues related to Head Start and child care. Both funding announcements aim to support work that will inform policy decisions and solutions, particularly for underserved/ understudied populations, utilizing the most rigorous research methodology, and promoting mentor-student relationships that support students’ independent lines of research. What is the funding award limit and project period? Applicants may apply for project periods up to 24 months with two 12-month budget periods. Up to $25,000 may be awarded for each budget period. What types of research are supported? Proposed projects must address applied research questions that will inform and improve Head Start and/or Early Head Start (for the Head Start Grants) or child care and Child Care and Development Fund (for the Child Care Grants). For suggestions of topics that may be of interest to ACF, please see each full announcement. For information about previous Head Start Graduate Student Research Grants and Child Care Research Scholar Grants , see http://www.acf.hhs.gov/programs/opre/research/project/head-start-graduate-student-research-program-0 or ­­­­­­­­­­­­­­­­­­­­­­­­­ http://www.acf.hhs.gov/programs/opre/research/project/child-care-research-scholars-0, respectively. When is the application deadline? Letters of intent are due March 1, 2018 and applications are due April 2, 2018. If you have questions regarding these grant announcements, please email HSGraduateResearchReviews@icfi.com, ChildCareScholars@icfi.com, or call 1-877-350-5913. The Office of Diversity and Inclusion and the Graduate School will host the 2018 Dissertation Boot Camp Friday (1/26) to Sunday (1/28). 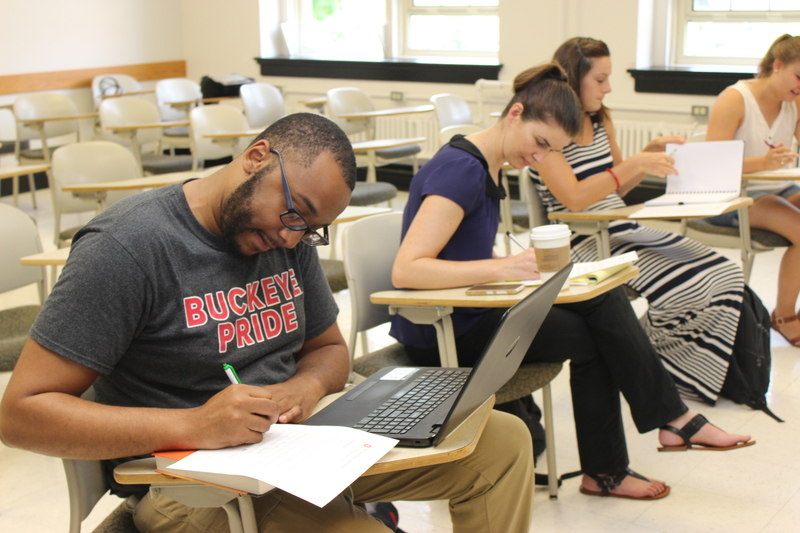 The retreat provides Ohio State doctoral candidates with the space to work on their dissertations with others; develop a plan to complete their dissertations; and create a strong support system for students across academic disciplines. Registration required by Friday (1/5). For more information, click here or contact Robert Bennett III, PhD at Bennett.460@0su.edu. The RMC will continue to hold open consulting hours throughout the summer. They will generally be held weekly on Wednesdays from 9:00-11:00am in the OSU Research Commons (3rd Floor, 18th Avenue Library) with a few exceptions. On May 17 and June 12, open consulting will occur in the RMC offices, located in 173 Arps Hall, and on July 5 and July 19, there will be no open consulting hours. For a full schedule of open consulting hours and locations during the summer, please visit our Consulting page. New consultants for Summer 2017! Find out more about the consultants here. In this 1.5 hour in-person session, we focus on the last part of the data management cycle: preparing data for sharing outside of the research team, depositing data into repositories and archiving. Amanda Rinehart will discuss the difference between archiving and sharing, when and what to share, best practices for protecting respondent confidentiality, and how to find an appropriate repository. Jessica Logan will share her experience with depositing Sit Together and Read data sets into the ICPSR repository and provide best practices on how to get data ready to be deposited. This is the last workshop of a series of three that focus on the data life cycle. The video and power points from the first workshop: Know Your Data: Security and Compliance Issues are available. Power points and resources from the second workshop: Managing Active Data are also available. 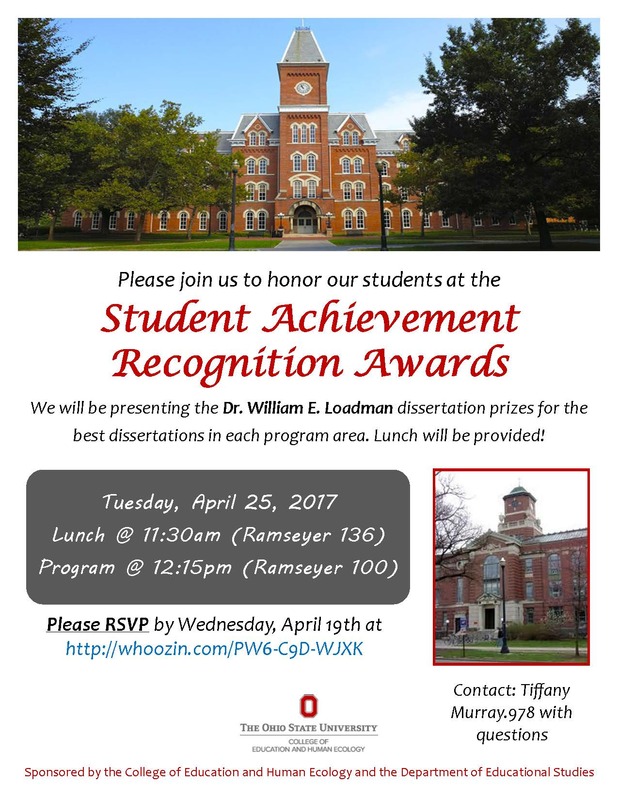 This workshop is for all OSU faculty, postdoctoral researchers, staff and graduate students with examples from the College of Education and Human Ecology. 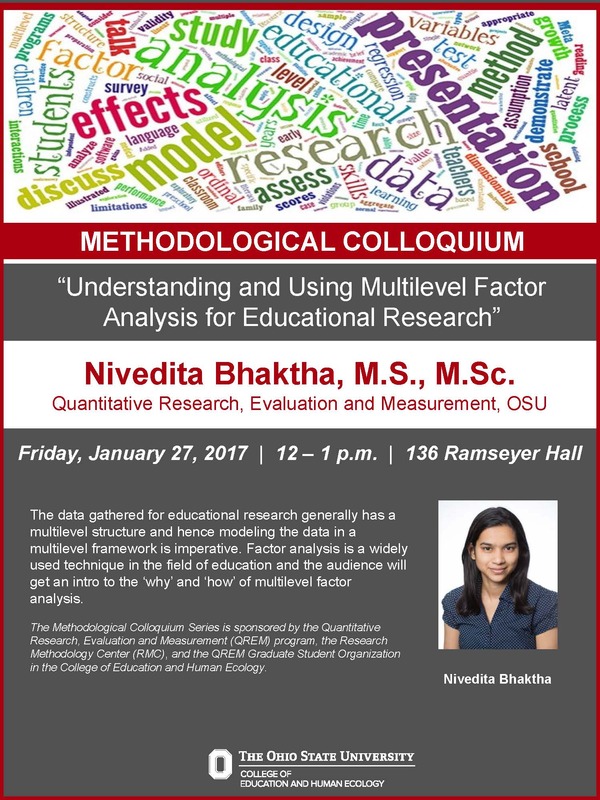 If you have any questions, please email Rebecca Chacko at Chacko.9@osu.edu. The Ohio State University and the Center for the Study of Student Life present the 7th Annual Student Affairs Assessment and Research Conference (SAARC). This is a one day conference taking place on Friday June 9th at the Ohio Union. The theme of the conference is Making Data Meaningful: Addressing Critical Issues. This conference is aimed at faculty, staff and students of all levels of experience across a wide variety of departments. Submit your proposal by March 31st here. Questions or more information: Franzi Ludemann- ludemann.3@osu.edu or Tawama Washington- Washington.181@osu.edu. The Association for Graduate Enrollment Management (NAGAP) is now accepting applications for the 2017-2018 NAGAP Graduate Student Research Grant. This grant opportunity offers $2,500 of funding to current masters or doctoral level students studying any topic relevant to the field of graduate education. This may include enrollment management topics such as alumni outreach, student retention, campus support services, faculty advising, technology, leadership, financial aid, internationalization, holistic admissions, student recruitment, etc. Recipients of the grant also receive support to attend the NAGAP conference to present their findings. Please see the NAGAP grant page for more information. 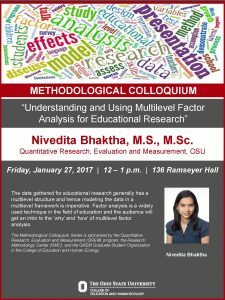 This Friday, 1/27 from 12-1pm in Ramseyer 136: Understanding and Using Multilevel Factor Analysis for Educational Research by Nivedita Bhaktha, M.S., M.Sc. GradShare™ by ProQuest is a graduate school blog written by graduate students from different backgrounds and academic areas. Check out dissertation advice, book and movie reviews, CV writing strategies as well as plain and simple, everyday advice from grad students. Search the archives to read posts beginning in 2014 to the present. ProQuest offers journal, database and ebook resources for researchers at all levels as well as events and webinars about various research topics. Students are also able to submit dissertations or theses to increase their visibility online. U.OSU.EDU on A Big Welcome!